Aug - 01 | By: admin | 2 comments. If you want to fly with the Forum in Langkisau hill, how easy ..!!! Langkisau hill that is located in the city of Painan. 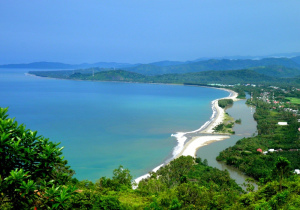 A city that is located in the southern province of West Sumatra which is approximately 88 km from the city of Padang and the long journey around 2 hours by car. Langkisau hill with a height of 214 mdpl take off with the direction of the sea that separated the Indian Ocean, is heaven Forum and tourism has become the icon with a myriad of unique. Looking up from the city Painan parachute Forum, fly like a kite in the outdoors while enjoying the island chain will add to the list of adventure paraglider, and Salido beach with a white carpet sand a location that’s convenient for landing paraglider. Another advantage Langkisau hill, we can fly above the city of Painan the landing site is located right in the middle of the city. But whoa ……. Painan flying over the city could not be made by all pilots especially for beginners, this is very risky because of the narrow landing location and the thermal that never ends. This is a challenge for pilots who want to try it out. 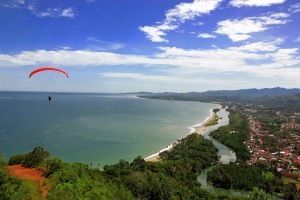 But do not worry colleagues from the pilot Langkisau Paragliding Club will always accompany and guide you. Who am i need to contact if i want to do this paragliding thingy?